Unable to get a better picture from the passenger side of a moving vehicle, I was surprised it came out at all. That is a normal view of the barns I know. Unfinished paint way back in my days. It has a misty dreamy quality about it. Pretty find! this one reminds me of one I've seen around here. I am duly charmed (again). Nice. 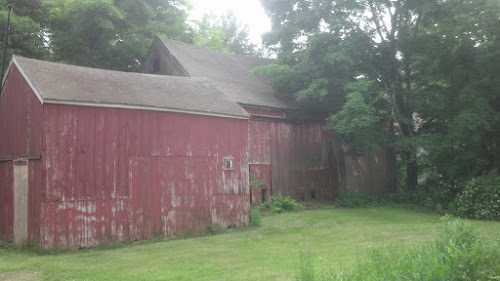 I have always liked New England barns. You did good! Looks like it was a misty day, which adds to the charm. You have a nice shot considering that you're in a moving car. I'm just nervous about the tree at the right corner of the barn. I think it would only take one heavy storm and it will fall straight to the barn's roof. It's good if the barn is unused, but if it's still in use, the owner will definitely have a great problem.